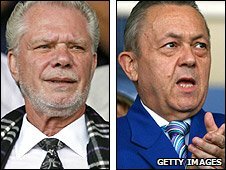 Ex-Birmingham owners David Sullivan and David Gold have tabled an offer to buy into West Ham, BBC Sport understands. The duo would take a substantial shareholding for a nominal fee, promising to invest in the team in January and offer expertise. They also want the option of buying the club outright at a later date. West Ham are owned by CB Holding, a company made up of creditors of Hansa, which was owned by former chairman Bjorgolfur Gudmundsson. CB Holding have appointed Rothschild and Standard Bank to try to find a new owner for the club. "Several parties" have made approaches and are involved in "an ongoing dialogue" about the possibility of buying the Hammers, according to a senior board member, but negotiations are still at a fairly early stage. Gold and Sullivan sold Birmingham to Hong Kong billionaire Carson Yeung in October, ending their 16-year tenure at the club. They bought the Blues for £1 and sold the club for £82m. The duo have a strong affiliation with West Ham and once owned a 30% stake in the Upton Park club. "West Ham will have to seriously consider Gold & Sullivan's offer"
Gold grew up opposite the Hammers' east London ground and represented the club as a youth player. West Ham are currently 17th in the Premier League after being beaten 4-0 at home by an injury-depleted Manchester United side on Saturday. They face a significant fixture off the field on Friday, when Straumur, who own a 70% stake in CB Holding, have a bankruptcy hearing in Reykjavik. Straumur want to extend the "moratorium" which gives them breathing space from their creditors. The moratorium is strongly expected to be extended for another nine months but if it is not, the company would go into liquidation and their assets, including West Ham, could be sold.